linkage mass is effectively multiplied so that it produces the same resistance to bolt acceleration as a very heavy mass located at point A. In this mechanism, the retardation ofTered by the linkage does not remain constant. As the bolt opens and angle "a" decreases, the bolt acts at a smaller disadvantage and the mass multiplying effect of the linkage decreases. The effect of this change is that the more the bolt opens, the less resistance it encounters. Figure 1-43. Compact Form of Toggle Linkage. tions may be more economical of space. A mechanism of this type, as used in the Schwarzlose machine gun, is shown in fig. 1-44. In some cases, the links may not pivot on hinge pins as indicated schematically in figs. 1-42 and 1-43 but may have cam-shaped ends which make rolling contact with each other as the links move with respect to each other. 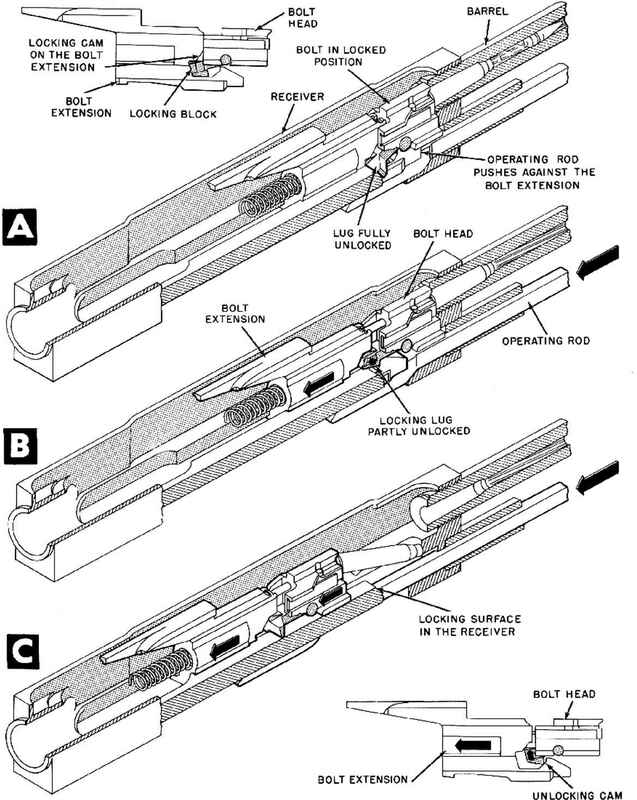 Linkages represent only one of many types of mechanisms that can be used to produce retardation by causing the bolt to operate against a high mechanical disadvantage. A wide variety of inclined surfaces, cams, spirals, wedges, screw threads, and other devices can be employed in such a manner that only a small component of the blowback force is effective in causing sliding or rotating motion of the mechanism. Many such devices are illustrated in part Xi of this publication and therefore will not be described here. parted to the recoiling parts by the explosion. 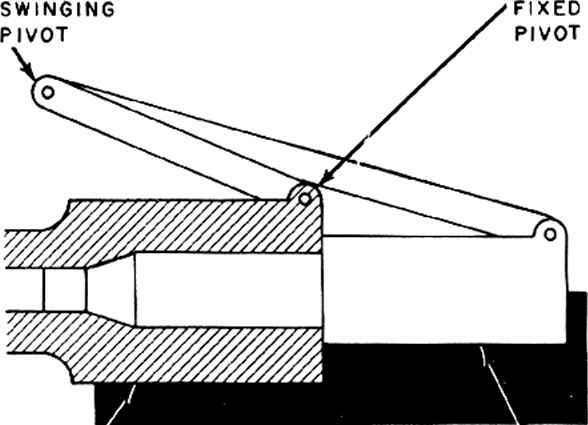 During the rearward motion of the bolt, the spent cartridge case is extracted and ejected and the bolt driving spring is compressed. When the driving spring and buffer have absorbed all of the kinetic energy of the recoiling parts, the bolt is pushed forward to pick up a fresh cartridge from the feed mechanism and load this cartridge into the chamber. After the cartridge is fully chambered, it is fired and a new cycle begins.